Harold is taking over our Instagram! Something curious is coming our way! The cast of Center for Puppetry Arts' Harold and the Purple Crayon is taking over UNIMA-USA's Instagram this Saturday, 4/20. Don't miss this special behind-the-scenes look at this innovative adaptation. Want to take over our feed for a day? Member companies can reach us at unimausa@gmail.com to pitch a one-day takeover idea. Jesús Caballero (left) constructing a puppet for the máquina real. Photo courtesy of Luis Caballero. We’re very excited about our new issue of PI – “Our Intangible Cultural Heritage.” If the precise meaning of this theme eludes you, Annie Katsura Rollins’s intro to her article (below) on the effect of this designation on Chinese shadow puppetry may help pierce the fog. In our wide-ranging articles on the subject, I believe we broaden the definition in a number of ways – all to the good! The magazine is being printed as I type, and should be out in mid to late April, along with lots of “bonus material” on the website: unima-usa.org/index – look for PI #45. I had the pleasure of attending two of the four days of the Ballard Institute and Museum of Puppetry’s Living Objects: African-American Puppetry Symposium and Conference, co-curated by Drs. Paulette Richards and John Bell (full disclosure—my husband). This gathering accompanied an exhibit which is currently on display at the Ballard Museum, University of Connecticut, through April 7th. The Symposium portion of the gathering included three full days of panel discussions, addressing topics such as Minstrel Performance, Puppetry and Community and Afro-Diasporic Storytelling, featuring scholars, teachers and practitioners sharing their experiences, research, and ideas. The Festival portion included performances by African-American puppeteers with diverse styles and themes. The Festival and Exhibit span an eclectic range of puppet genres and performance styles – including shadow, marionette, rod, bunraku, over-life-size figures, an evening of ventriloquism, a Sunday morning of Gospel Puppetry, screenings of contemporary films, and a revival performance by the legendary Crowtations. The powerful thread linking the artists and scholars is their shared passion for identifying a common cultural heritage, one whose history is strongly rooted in African mask and object ritual, and was savagely severed by slavery. Both the exhibit and the Festival put a spotlight on the beauty and struggles they share. And I sensed joy among them, in the chance to come together, to discover both common histories and widely differing puppetry styles. I was told that this is the first such exhibit since one produced by the Center for Puppetry Arts 25 years ago. As Brad Brewer said, let’s not have to wait another 25 years for similar recognition! I felt privileged to be in that space, and I believe that other participants felt the same – a space which nurtured my spirit and educated my understanding of the African diaspora. If you can get to UConn before the exhibit closes on April 7th, I encourage you to go see it. If not, extensive documentation of the exhibit and (coming soon) symposium is posted on the exhibit website. Participants from Baltimore. From left to right: Valeska Populoh, Dirk Joseph, Azaria Joseph, Sequoia Joseph, Sheila Gaskins, and Schroeder Cherry. Drew Allison. Photo by Simon Hare. Join the McClellanville Arts Council in a celebration of World Puppetry Day which falls annually on March 21. The Arts Council will host an exhibit of puppet creations by long-time puppeteer Drew Allison. Over 25 puppets will be exhibited from past performances, on-camera appearances and commissioned works. The story of each puppet and their role will accompany each piece. Puppeteer Drew Allison will be on hand to chat at the Exhibit Opening on March 21, 2019 at 7:00pm at The McClellanville Arts Council Gallery. The exhibit will run from March 21, 2019- April 13, 2019. For additional information about Drew Allison and his company called Grey Seal Puppets, see their website at www.greysealpuppets.com or check them out on social media. Donald Devet recently created a blog featuring puppet performance reviews he wrote while living in New York City from 1999-2009. During those 10 years he reviewed shows by Ralph Lee, Basil Twist, Gretchen Van Lente, Janie Geiser, Liz Joyce, Kevin Augustine, Lake Simons, Edward Einhorn and many more. Donald’s intent in creating a blog of reviews is to provide a model for other reviewers, both in and out of the puppet world. As you are well aware, puppet performances are often given short shift by many commercial theater reviewers who are oftentimes unfamiliar with puppetry as a theatrical art form and sometimes don’t take the work seriously. Because of his extensive background in stage puppetry, Donald has treated the performances in his reviews with respect and has given an honest evaluation of the performers’ intents. He believes it’s beneficial to puppeteers and the public at large to visit a blog site dedicated specifically to reviews of puppet shows. Donald’s goal in creating “Puppets In Review” (https://puppetsinreview.home.blog/) is to demonstrate that puppetry should be given as serious consideration as any other performing arts genre. The Ballard Institute and Museum of Puppetry at the University of Connecticut is pleased to present the Living Objects: African American Puppetry Festival and Symposium to celebrate the rich world of African American puppetry in the United States. This four-day series of performances, presentations, discussions, film screenings, and workshops will take place February 7 to 10, 2019 in Hartford and Storrs, Connecticut. Activities for the Living Objects: African American Puppetry Festival and Symposium will occur in various venues on UConn’s Storrs campus February 8 to 10, with related festival events with UConn Hartford at the Hartford Public Library on Thursday, February 7, 2019 and at the Wadsworth Atheneum Museum of Art on Saturday, February 9, 2019. 1. Living Objects performances in Storrs and Hartford are open to the public. Individual tickets can be purchased at bimp.ticketleap.com. 2. To attend all Living Objects Festival and Symposium events, including performances, panel discussions, film screenings, and more, registration is required. Registration can be completed at www.cvent.com/d/bbqbh7. The festival will feature performances by Tarish "Jeghetto" Pipkins, Megan Piphus, David Liebe Hart, Dirk Joseph and String Theory Theater, Pandora Gastelum, Bruce Cannon, Nate Puppets, Yolanda Sampson, Edna Bland, and more! These events are part of the current Ballard Institute exhibition Living Objects: African American Puppetry, on display through April 7, which for the first time brings together historical and contemporary puppets, masks, and performing objects by African American artists and puppeteers. Many of the exhibition's contributors, as well as scholars from around the United States, will come together at the festival and symposium to celebrate the past, present, and future of African American puppetry. Living Objects Festival and Symposium registrants may purchase one-day, three-day, or student passes to attend all festival and symposium events. Registration will include breakfast and lunch. To register for a one-day or three-day pass to the festival and symposium, visit www.cvent.com/d/bbqbh7. To read more about the Living Objects exhibition and festival, visit bimp-exhibitions.org/livingobjects. Pikz Palace company’s Boucherie Bacul. Photo by Colette Searls. I recently returned from the 2018 Puppet International Festival in Meppel, Netherlands, which hosted companies from across Europe the week of October 10th – 14th. One of the most exciting performances was the one-night celebration of puppet royalty, Masters@Work, with breathtaking acts by Jordi Bertran, Tristan Vogt (Thalias Kompagnons), Neville Tranter (Stuffed Puppet), and Meppel’s own Henk Boerwinkel. In addition to these standard-bearing stars, the festival offered a balance of outstanding established and up-and-coming companies working in a wide range of puppetry styles. Yet interestingly, some of the most moving shows involved little or no direct human animation – what we might strictly define as puppeteering – but seemed to celebrate the expanding art of puppetry/material performance by other novel means. The Dutch group BOT offered a particularly touching and mind-bending performance called LEK (Leak/Leaky), a kind of object concert featuring a menagerie of invented (as well as wildly modified) tools and instruments playing with a quartet of musicians. At various points, one of these strange kinetic objects would suddenly jolt to life and move itself autonomously across the stage (particularly eerie was a self-playing cello in a wheelchair). BOT is primarily a site-specific touring company, and one of the performers explained to me that their reputation lies more along the lines of “object performance” (as he put it in English) than puppetry. But after appearing at the World Puppet Festival in Charleville-Mézières, they started hearing from other puppet festivals like this one. 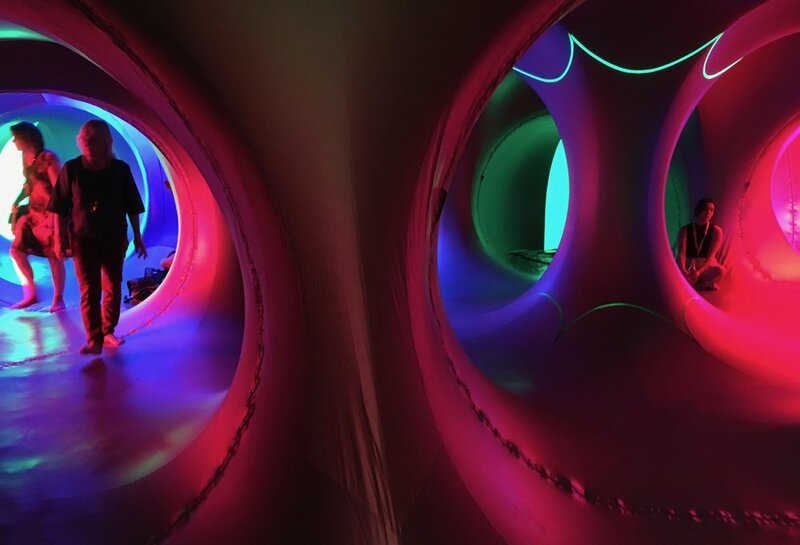 Architects of Air (Alan Parkinson)’s Luminarium. Photo by Colette Searls. The Meppel festival also proudly hosted the Architects of Air (Alan Parkinson)’s Luminarium, which is not a puppet show, but rather an enormous sculpture you get to walk inside. This beautiful installation looked from the outside like an artsy circus tent, and from the inside like the stomach of some benevolent alien whale. Visitors were invited to enter the colorful curved hallways and rooms, lie down, take pictures, meditate – most folks seemed happy to just find a spot to relax in awe. There were no moving objects and no performers. But the experience was still dynamic – a masterfully designed animation-interaction of hard materials with intangible elements of light and air. My weirdest object-performance experience was with Pikz Palace company’s Boucherie Bacul in Meppel’s town square. I caught this funny, imaginative show during the “Hapas Rout,” where the audience walked to puppet performances staged at local eateries. As we followed our leader through the town square, we came upon this small, blood-splattered butchery with a mix of delight and horror as – upon closer inspection – we realized that this middle-aged couple was serving the flesh of dolls and stuffed animals. Treated as customers, we were quickly ushered into a comically grotesque hands-on toy butchery demo. No Barbies were puppeteered, but many were harmed. Badly. The butchers assured us that they were all well-used, and no longer able to fulfill their toy duties. But that didn’t stop us from cringing while they skinned a Burt doll, or placed a Pikachu in the meat slicer. I don’t know how much irony was intended, or if there was a vegetarian agenda here, but the resonant power of performing objects was as much on display as the pickled Barbie heads. Perhaps all of this is a sign that puppet festivals today are looking to present an increasingly wide range of performing object work. If so, it may bring more attention to the aesthetic potency – and interdisciplinary reach – of puppetry/material performance as a whole. If you’d like more details on the Puppet International Festival in Meppel, please read my upcoming review in the next issue of Puppetry International. Scholarship Application Deadline Extended to December 15th! Apply now for the 2019 UNIMA-USA Scholarship to Study Abroad! • Applying for aid to study with a recognized puppetry professional or professional program outside of the United States, or to attend an international puppetry workshop. Independent study plans are also eligible. Questions? Contact Scholarship Representative Honey Goodenough atscholarship@unima-usa.org. For this well-deserved tribute, we join the International Puppetry Institute, the World Festival of Puppetry Arts of Charleville-Mézières, THEMAA and Latitude Marionnette to honor the memory of this great woman for her huge contribution to the Puppetry Arts throughout her life. The world of Puppet Theater will always be in mourning. We invite you to join us for this tribute to be held on December 15 2019, at 7PM at the Theater of the National Superior School of Puppetry Art (16 avenue Jean Jaurès, Charleville-Mézières - France). It is hard to believe that almost a year ago I was working on my application for UNIMA-USA’s annual scholarship to study abroad. Thanks to the committee’s generosity, I am here in Paris participating in the 5-month Annual Training for actor-puppeteers at the Théâtre Aux Mains Nues. Having spent the years during and after college exploring my love of puppetry in many forms, mostly in my free time, I decided it was time to make a choice to commit myself more seriously to the craft. I felt that the time was right for a more sustained training program. Inspired by the prospect of the UNIMA-USA scholarship, and eager to experience puppetry outside the United States, I did some research, found this very unique program, and applied. And here we are! We just finished the sixth week of our training here, which is four full days per week. The program is very small, with only seven students; four from France and three from abroad. The coursework includes a rotation of core classes, which include voice, body, acting, principles of animation, and glove puppet manipulation (in French, marionnette à gaine). This particular technique is completely new to me and has been fascinating to dive into. The style of puppet has a long history in France, famously in the form of Guignol. In our other classes we work with and without glove puppets, and have more recently begun exploring object manipulation. We will encounter many more styles and forms in the weeks to come, drawing from the theater’s supply of many different styles of exercise puppets. Soon we will also be moving into a phase of the training where each week a different guest artist comes to do a mini-unit with us on a particular style of puppetry. I am particularly looking forward to two full days that we will spend at a giant puppetry studio. In the last phase of the training, we will be creating a collective final piece for public presentation with a guest director, Claire Heggen, and designer, Pascale Blaison. Just last week, we all finished making our own "Gaine Lyonnaise" from start to finish. We followed a specific traditional pattern from Lyon to make the glove/body, and each constructed our own unique heads out of clay, which we then finished with paper-maché. We'll be using these puppets going forward in our courses as exercise puppets. Not only has the training itself been incredibly rich, the team of instructors, resident puppetry companies, and theater staff at TMN have made this experience especially unique. I have already been able to see several excellent puppet theater performances, at the Théâtre Aux Mains Nues and the Théâtre Mouffetard, another theater in Paris that exclusively programs puppetry. There are several other upcoming puppetry performances and festivals in town that I am really looking forward to. It has also been a wonderful treat (and challenge) that the program is entirely in French. Many people have been delighted that news of the theater has made it to the United States, and are surprised that I have come to France just for the training. I always credit UNIMA-USA for getting me here; both for providing the scholarship itself, and for maintaining an excellent listing of programs, workshops, and festivals abroad. I would not have taken this step without their support, and it has already opened me as an artist to be here in ways I could not have imagined. And we aren’t even halfway through! Here’s to seeing what the next three and a half months bring. I received the 2018 UNIMA-USA Scholarship to Study Abroad, and it seems cheap to call it “life-changing”. I will say that any attempt to explain my experiences, studies, the friends I made, any of it, will fall short. In 2017, I attended a masterclass at The Center of Puppetry Arts with Hachioji Kuruma Ningyō, a puppetry troop from Japan, led by Koryu Nishikawa V. Kuruma Ningyō incorporates all the beauty and fluidity of movement of Ningyō Jōruri (bunraku) style, but performed by a single puppeteer, on a small cart. I told Nishikawa-san I wish I’d known to seek it out when I was in Japan (months earlier). He told me the next time I was in Japan he could teach me this style and more. I applied for the scholarship to do just that, and attend the Iida Puppet Festa, an international festival in Iida, Nagano. I was also invited to teach my own workshop at a small craft cafe in Tokyo. Practicing with Japanese traditional puppets in Iida. My time in Hachioji was brief but incredible. I dropped in on a summer program and stayed after to watch the troop rehearse. My Japanese is limited (but functional), so most of my learning was movement-based. My notes consist of sketches, designs, and shorthand directions. My last evening there, during a typhoon, we lost power. We spent a few hours in the dark theatre, playing Japanese pop songs (of which I know exactly one, but it was played) on a guitar. It was one of many unexpected moments of “cultural exchange” that I treasure most. The following days were spent in Iida, which, on its surface, seems entirely devoted to apples and puppetry. The city is full of public art on these themes, including a “Puppetry Clock” which every hour, invites passers-by to see an animatronic puppet show, with an appearance by “Poh”, the yellow-clad, apple-hatted mascot of Iida Puppet Festa. I saw shows and met puppeteers from all over. Highlights included the following: speaking Japanese to a man who translated to Russian for new Russian friends; trading phrases with puppeteers from the Basque country, as they taught Japanese kids “The Macarena” in giant parade puppets; unexpectedly finding a new best friend with limited English, and falling in with his troop, Divadlo Alfa, from the Czech Republic (who I’ll visit soon, after this chance run-in); and being taken to lunch by a Japanese grandmother and grandson, to whom I gave some of my workshop eyeballs (“te-me”, meaning “hand-eyes”). In Iida, I continued studying Kuruma Ningyō, as they were also there. Before leaving, I said goodbye to my sensei, who I’d not see for the rest of my trip. I tried to explain in Japanese how grateful I was for this opportunity, but that I didn’t have words in Japanese, nor in English. “It’s overwhelming!” I said in English, because I don’t know that word in Japanese. “Ah! Overwhelming!” Nishikawa-san exclaimed, understanding. I adjusted a few days of my trip to visit my new Czech friends in the tiny town of Higashi-kagawa. Divadlo Alfa was performing their Three Musketeers show at Toramaru Puppet Land, a set of plain buildings on a hill in the middle of nowhere. Inside is like a Japanese version of the Center for Puppetry Arts. It has an incredible theatre and museum, complete with hands-on learning, a monitor set-up, and one of the densest puppet-populated rooms I’ve ever seen. I was only there for a day, but it was one of my favourites from that trip. Plenty of this trip I knew would blow my mind, but it was the unexpected detours that stick with me the most. Back in Tokyo, I had a workshop. 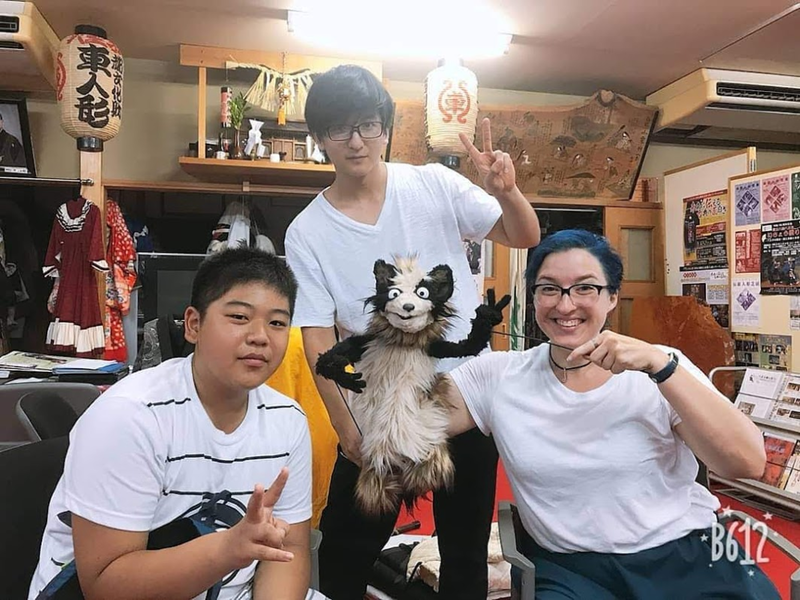 I had some puppets with me, and a tanuki hand-and-rod style puppet I made just for this trip (and used throughout, to the delight of children and several adults). We used sets of te-me I made, and worked on characterization through movement. Before long we were sticking the eyes on inanimate objects and creating new characters. It was a true test of my Japanese (one of many) and a perfect day with new friends. Toward the end of my trip I no longer felt sad if I missed something,“I’ll be back,” I realized. This scholarship was an introduction to so much: Kuruma Ningyō, Japanese (which I studied nonstop since accepting the scholarship), Czech puppetry (I’m set to do more with my friends over there), and has become fodder (both in content and design) for my work in progress. If anyone is interested in this scholarship, apply for it. You’ll learn so much: what you intended to learn, and so much more, if you’re willing to work for it and wander off-course a bit. Tanuki-chan (puppet) and friends. From Soh’s (center) Instagram. The Natural History Museum of Los Angeles County (NMHLA) is inviting you to respond to this Request for Proposals. NHMLA plans to select an experienced artist to develop and fabricate a new puppet to be used in regular programming at the museum. The Performing Arts program is dedicated to providing the communities of Los Angeles County with performances that explore and interpret the intersection of history, art, and science using puppetry and its associated arts. 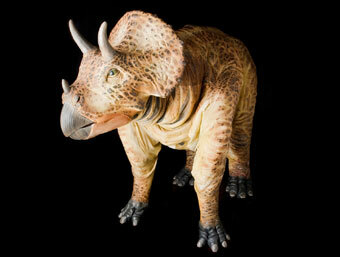 The program currently produces the popular Dinosaur Encounters and Ice Age Encounters performances alongside a wide variety of other museum theater offerings based on events and exhibits. The program strives to exemplify and iterate upon the museum’s vision in all of its endeavors— to inspire wonder, discovery, and responsibility for our natural and cultural worlds. All proposals are due by 4:00pm on December 15, 2018. No faxed proposals will be accepted. Emailed proposals are preferred, but hard copies are accepted. All proposals should be sent to The Natural History Museum of Los Angeles County C/0 Ilana Gustafson at the following address: 900 Exposition Boulevard, Los Angeles, California, 90007. All questions or comments concerning the Request for Proposals should be addressed to Ilana Gustafson, Manager of Performing Arts at igustafson@nhm.org. A Tarumba - Teatro de Marioneta from their production This is not Gogol’s Nose. A Tarumba performed and taught toy theater workshops at pop-up puppets in stockholm, sweden. Geoffrey Cormier asked me to blog on Long Range Planning for UNIMA-USA. I went for a walk in the meadow and thought, "Okay, what is the plan?" And then I thought, "World Peace." I thought about this especially because of the world we live in now. With the distance between manipulator and the manipulated on the Internet, we are seeing an increased space between crafter and the creation, which is sometimes ugly. Of course non-puppet people think that is what puppetry is about—hiding behind and pulling strings. But anyone who has been above or under an actual puppet knows that what you can do with the figure is already implicit in its make-up. We are attached to our object and in it—one thing with it. One of the beauties of puppetry is that it can range from very small (think toy theatre) to very big (think King Kong on Broadway). What is great about UNIMA is it puts us, through festivals, commissions, and publications, in contact with others who understand that connection of made environment and self and, like us, use objects to explore important stories. We are puppet people. We live in a world which needs more empathy and hearing across national and international divides. UNIMA-International next spring will hold its 90th anniversary with performances of stories of friendships through puppetry that crossed "enemy lines" in WWII. These are stories about peace with others and our world. I spent my summer seeing our common concerns first in Asia and then in Europe. I was invited to speak at first the International Conference on Islamic Thought and Culture in Perak, Malaysia. I reminded the speakers gathered from across the Muslim world as we talked about curbing terrorism, using religion as a force for good, and creating a just social order that puppetry is one of the deep historical arts of the Islamic world from Karagoz (created we are told by the dervish Seh Kusteri) to the Indonesian saint and puppet master Sunan Kalijaga. Object theatre is to share visions of goodness and justice. Soon thereafter, I was speaking in Sweden for a seminar at Pop-up Puppets at the Marionetteatern's 60th anniversary in Stockholm where Punch, Pulchinella, Pochinelle, and Dom Gil performers had gathered from across Europe to perform alongside troupes that were creating new work to respond to the migrations and rise of xenophobia in Europe from the immigrations due to the crisis in the Middle East. I reminded the seminar that the comic clown associated with traditional European puppetry has iconography and that swazzle voice that may trace back to north India and the interrelationship of "gypsies" (i.e. migrating groups) and those puppet traditions can be pointed out historically. Most of our great puppet clowns are at least cousins. We may not have DNA kits for figures—but we can trace the path of first mentions (often in police records complaining of the puppeteer-acrobats-dancers-musicians-tooth pullers that pull into town). Among the artists who were co-presenting were NY puppeteer Roman Paska who I had first met on a puppet stage one night in Indonesia. Also there was the head of UNIMA-International Dadi Pudumjee whose Ishara Puppet Trust welcomes puppeteers from all over the world to perform each spring. Dadi had studied in Sweden in the 1970s with Michael Meschke who founded the Marionetteatern in 1958 (Meschke was himself a Jewish refugee from Nazi anti-semitism). Meschke long had collaboration with Asia and he helped popularize Bunraku style manipulation now so popular in the west. Meschke's early Ubu Roi which mixed puppets, body puppets, and avant-garde imagery was part of the display we saw in the newly opened performing arts museum—his reaction to the propaganda of WWII and the early Cold War. Meschke made peace with puppets--doing workshops in India, Thailand and beyond. He was one of the ones who put UNIMA back together again after WWII. Helena Nilsson, current head of the company, and Margareta Sorenson, who put together the seminar, were carrying on Meschke's vision: peace via puppets. Use art to talk about connections, to greet refugees, and to help solve misunderstandings. When Jim Henson went for a walk on a British heath while brainstorming about an internationally syndication-potential TV show with puppets, he had a brainstorm: "World Peace," he suggested, should be the nub of the show. It became Fraggle Rock. Henson who was founding president of UNIMA-USA was also propelling us toward peace in founding our organization. We make puppets, not war. We recently sent our greetings to UNIMA-Russia on their 60th year (see Kurt Hunter’s video of congratulations). We look forward to our Prague Spring in 2019 when UNIMA-International will toast its 90th year. We are an organization that crosses time-zones, borders, oceans. The marionettists and the Robotics nerds are friends. Our long-range plan is a just, equitable, and peaceful world where we and the material world—our puppets—are in sync. The puppeteer and the object must always be one for the show to go successfully on. If Issue #44 of Puppetry International has not arrived in your mailbox yet, it will soon. As an UNIMA-USA Member, though, you can enjoy it right now on your laptop, tablet, smartphone or any other device you use to link to the internet. Just go to the Current Member Portal. Once you log in with your current Member password, you can read the entire magazine. This is the "Puppetry and Social Justice" issue and it is full of compelling stories about people who are working to make a difference, and, of course, lots of amazing puppets! Happy reading! Read more about issue #44 in our Puppetry International Index. You can purchase copies in our online store. For the past year and a half Bob Nathanson of Puppets To Go and I have produced movie posters satirizing the current political climate here in the USA. His comedic sense and my computer skills have proven a fruitful combination. We’ve produced over 450 posters and continue to feature a new poster five days a week. Bob is an active touring puppeteer whereas I morphed my puppetry skills into video and graphic production in 1999. Our method of speaking truth to power is meant to evoke a reaction: a laugh, a knowing nod, or sometimes, disgust. Our puppetry experiences have paid off for Bob and me in the creation of our posters. Years of writing and performing shows have honed our abilities to zero in on a topic and deliver a powerful message. Even though we are no experts in political puppetry, we are motivated by the shifts in political ideology to put our skills to work in calling out political perversity. We follow in a great tradition, for wherever there is political disorder puppets have been drafted into service as voices of dissent. For a detailed overview of puppets used in time of oppression, read K. Ruby and Morgan Andrews’ “History of Radical Puppetry.” Another good political puppetry resource is the website Puppetry Films. Six short videos demonstrate puppets used in protest in South Africa, Kenya, and the USA. Maybe you are toying with the idea of using your puppetry skills for political purposes. We encourage you to do so. You don’t have to take to the streets with oversized caricatures to communicate. Political messages can be weaved into your current repertoire. For instance, when I was performing with Drew Allison of Grey Seal Puppets, we satirized Richard Nixon in our adaptation of The Emperor’s New Clothes. The emperor’s line, “There are no bugs in the palace,” drew knowing chuckles from adults in the audience. We also produced an adaptation of Orwell’s Animal Farm, an allegorical novella written in 1941, reflecting events leading from revolution to tyranny that rings even truer today. More recently, I produced a 53-episode web series satirizing the 2016 election. A puppet “Harold” discovers the rough and tumble world of American politics as he runs for President. My experiences producing the “Harold and Me” series is featured in the 2016 fall issue of Puppetry Journal. Whether your political puppetry takes the form of a live show, a video or even a poster, you’ll be joining a long line of puppeteers using puppets to challenge authority. After a 50-year career in puppetry, Aurora Valentinetti has been awarded the 2018 Distinguished Teaching Legacy Award for her work in the University of Washington's School of Drama. Read more about Valentinetti's incredible career and lasting legacy here.